To make the card I used lemon A4 card stock, Gold card stock, Spellbinder Nestabilities and Labels 17 and an embroidery. I created the designs to be printed on the card in Photoshop, using some items I had purchased for scrapbooking. These I adapted and printed on both sides of the card. On the back I also printed my logo, name and e-mail address. I followed the instructions for Flip card given by Christina and I must admit I had a couple of trial runs to get it right. Then added the peel-off to complete the card. 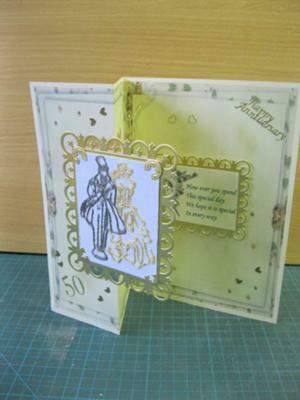 Having the tenacity to continue making the card is what pays off when you create something as lovely as this. So if at first you don't succeed .... you know the rest and wll done to you for this card. If you would like to get the same fold as Shelagh then take a look at the Video Tutorials in the NavBar to your left. You will find lots of different folds there to help you get the most from your cardmaking .... and stop you getting bored.... so I hope you will give them a try. And don't forget to add them to the Gallery just as Shelagh has done with her card. I did the digitising myself for a picture of a rubber stamp I could not purchase anymore. Could e-mail it to you if I had your e-mail address. I WAS IMMEDIATELY ATTRACTED TO THIS CARD BECAUSE OF THE EMBROIDERY.I LIKE IT VERY MUCH.